The last day of the 2012 IAAF World Indoor Track and Field Championships was a good one for two American runners in particular. 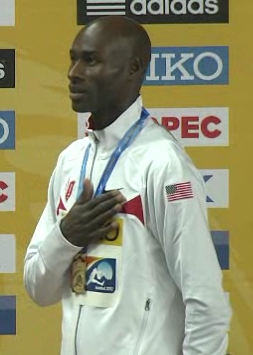 The legend, Bernard Lagat, was victorious once again, while a new star was born in converted heptathlete, Erica Moore. A bigger surprise was in the Women's 800, where the fledgling star, Erica Moore, took the field out hard from the gun and held on over the last straightaway for a hard fought Bronze Medal. Moore looked incredible even after she was passed over the last lap and held her form until the last 10 meters or so when gravity began to take over. She dove through the finish to hold off a hard charging Fantu Magiso for the Bronze and a new PR of 1:59.97. Kenya's Pamela Jelimo returned to form after a few awful years for the win, while the Ukraine's Nataliia Lupu took the Silver. Thanks again to our sponsor, RaceSplitter, for sponsoring the blog this week. If you're interested in sponsoring writing about running (and other great sites like TrackFocus, Track Superfan, Paul Merca and the House of Run podcast) in the future, check out The Relay Network.